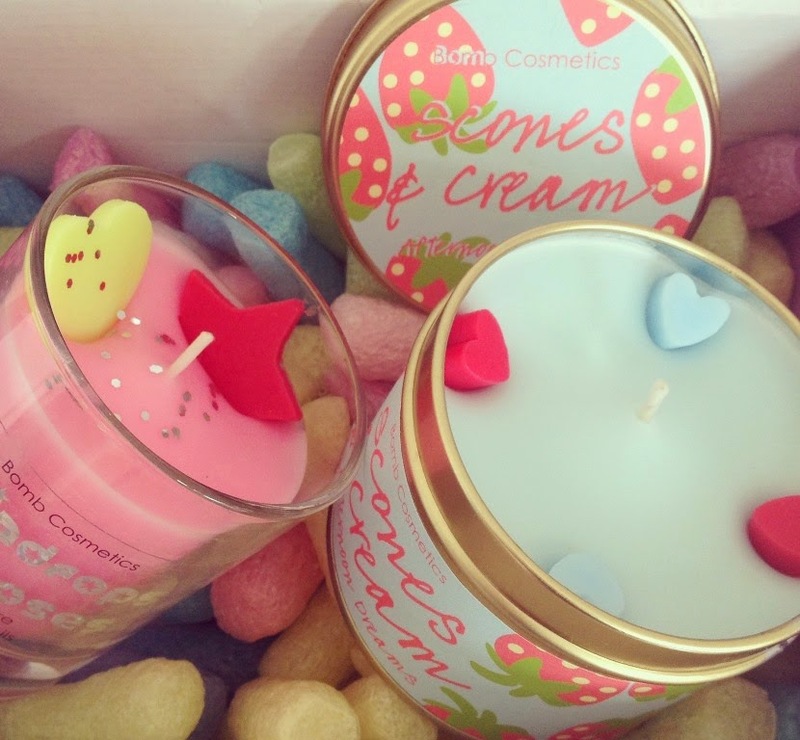 This week my home has been brightened up with the addition of these super cute candles from Bomb Cosmetics. Not only do they look great as a home accessory but they smell incredible too. 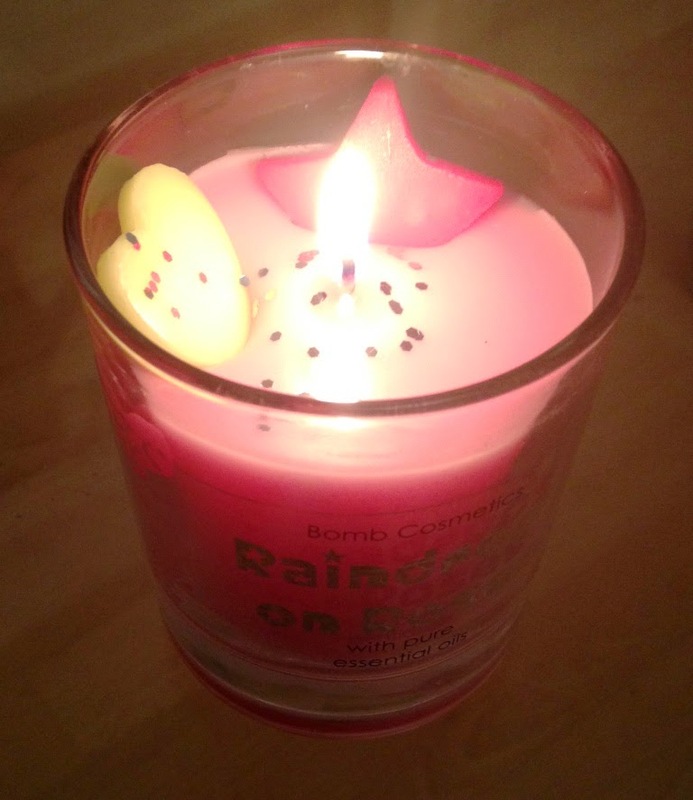 Pretty unlit and lit, the first candle is from the Fresh and Funky Glass Candle collection - Raindrops on Roses. Pink wax, a sprinkle of chunky glitter and a heart and a star. Raindrops on Roses is described as - Fresh & dewy, this elegant floral scent opens with fruity top notes of grapefruit, cassis, apricot and bergamot along with green leaves. 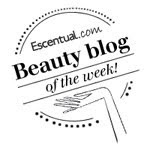 The spicy heart centres around muguet, rose and jasmine, resting on a woody, musk base. This smells so nice and fresh when unlit and when lit the scent is beautifully fresh too. Perfect for Spring/Summer days. The foodie and afternoon tea lover in me couldn't resist Scones & Cream, An Afternoon of Dreams. This is from the tinned candles collection. Blue wax with pink and blue hearts. Adorable packaging and design, inside and out. I would definitely be tempted to try more. A rich afternoon tea with nuances of lemon sherbet on a heart of tempting vanilla and butter biscuit. With geranium and rose essential oils. Unsurprisingly this is has a gourmand fragrance that smells good enough to eat! This is very sweet, personally I adore it and would light this to relax, write poems and stories and just drift away in a whimsical dream... however my husband wasn't so keen on this. He preferred the fresh smell of Raindrops on Roses. 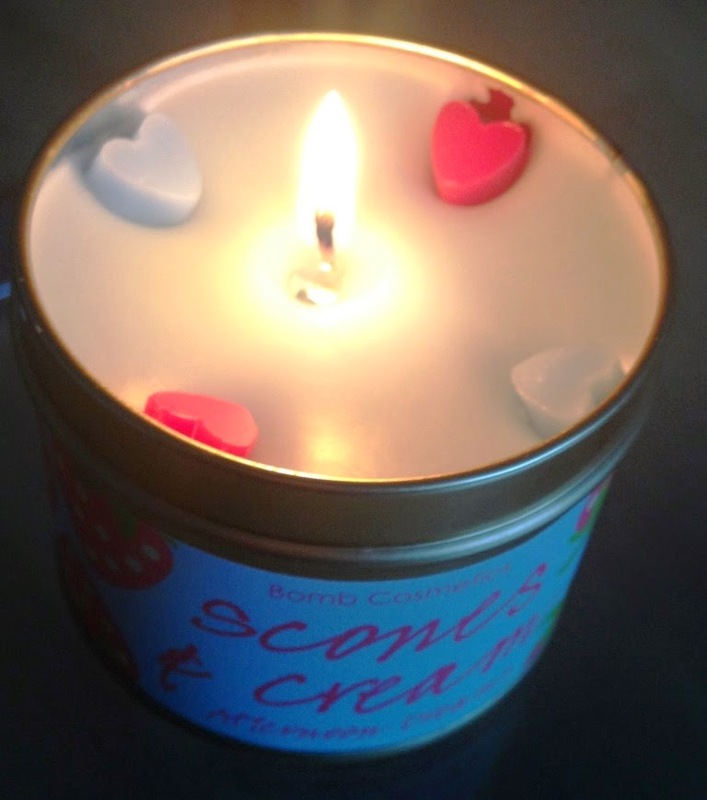 Bomb Cosmetics candles contain essential oils and are all hand poured, even the shapes are hand cut! What a lovely introduction to the brand. I will be back..